VfL Wolfsburg's 3-2 win over KAA Gent in their UEFA Champions League Round of 16 first leg has been overshadowed by a serious injury to right-back Sebastian Jung. The 25-year-old, who had to be helped off the pitch shortly before half time at the Ghelamco Arena, underwent tests on Thursday that revealed a torn cruciate ligament in his left knee. 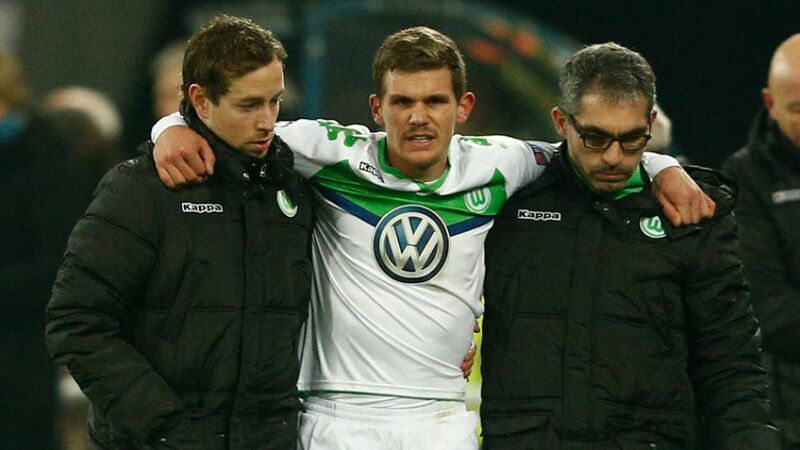 "The injury is tough for Sebastian to take," said Wolfsburg head coach Dieter Hecking. "He's shown a great improvement of late and shown how important he is for the team. We wish him well and a quick recovery." "I’ve put a lot into the Rückrunde," Jung added. "Now I have to digest the fact I won't be able to help the team reach our targets. I'll do absolutely everything I can to get fit as quickly as possible and be in a position to play again." Wolfsburg, currently five points adrift of the Bundesliga's coveted top four, face Hertha Berlin, FC Bayern München, Hannover 96 and Borussia Mönchengladbach in the coming weeks, before welcoming Gent to the Volkswagen Arena for the decisive home leg of their Champions League last 16 tie on 8 March.